Sense on Cents once again thanks our friends at 12th Street Capital for providing tremendously useful information and analysis. What do we learn today? 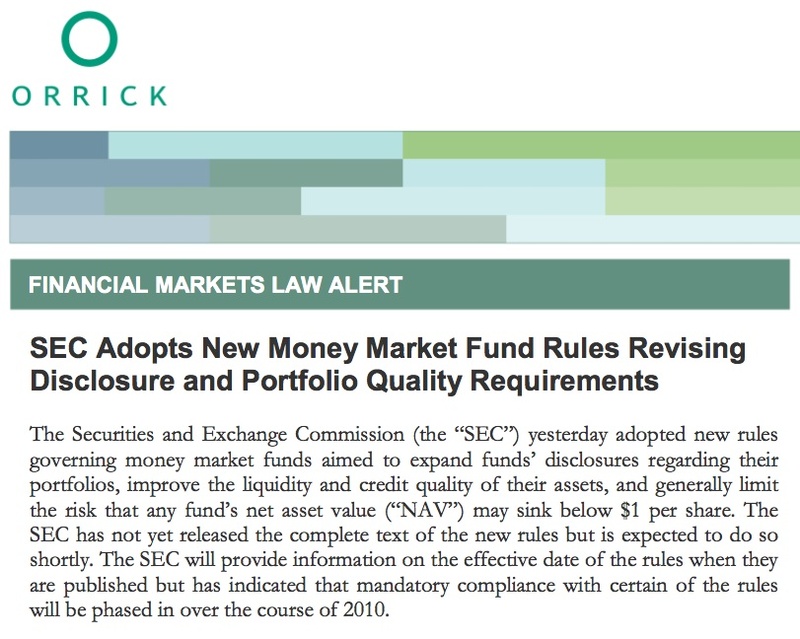 The new rules adopted by the SEC for money market funds. The overview of these rules is provided by Orrick, Herrington and Sutcliffe LLP. The driving force behind the new SEC rules is an effort to promote greater disclosure and liquidity within money market portfolios. After the crisis of 2008-whenever (it’s not over yet), money market funds were and are much riskier than previously perceived. The risks lay in the fact that these funds invested in a fair amount of risky assets. Now that the government backstop of this industry has ceased, the new rules are needed for the industry to move forward. Investors need to know that when these rules are effective (sometime in 2010), funds can ‘break the buck’ ($1.00 NAV, net asset value) and suspend redemptions. Navigate accordingly knowing that the money market industry is not what it used to be. Money Market Funds Losing Uncle Sam’s Support…Today!! Traditionally, the money market industry has prided itself on its ability to market these funds as being the effective equivalent of bank deposits. Bank deposits, however, are federally insured up to 250k. Money market funds were presumed to have such safe investments that they would always maintain a $1.00 NAV (net asset value). That ‘sales pitch’ worked for a long time until a year ago when Lehman failed. 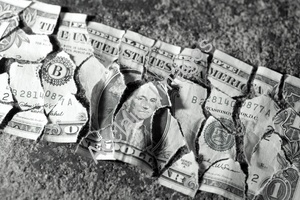 A number of funds holding short term debt issued by Lehman, as well as other questionable assets, were poised to ‘break the buck.’ Hank Paulson and Ben Bernanke realized they needed to step in to stem this flow of money so they implemented a federal backstop of these money market funds. That backstop ends . . . today!! As such, whether investors appreciate it or not, they now have significantly more risk in these funds. Now that the panic that flowed through financial markets last year has eased, the U.S. Treasury Department is making way for an usual rescue program set up to protect money-market funds to expire Friday. U.S. officials established the Guarantee Program for Money Market Funds one year ago, during the height of the financial crisis, in the wake of the failure of Lehman Brothers Holdings Inc. But now that an economic recovery might be taking hold, the government is allowing the program to wind down. “As the risk of catastrophic failure of the financial system has receded, the need for some of the emergency programs put in place during the most acute phase of the crisis has receded as well,” Treasury Secretary Timothy Geithner said in a statement. Secretary Geithner may be premature because although markets have recovered, a number of sectors of our overall economy remain severely stressed. The investment assets correlated with these sectors are no longer deemed as safe as once thought. While the panic on Wall Street has obviously passed, investors in money market funds should not blindly accept that these funds will maintain a $1.00 NAV going forward. The fact is, many of these funds do have investments in a variety of short term instruments that have declined in value. While the SEC has recently implemented rules in an attempt to insure that money funds will have sufficient liquidity for investors, those rules do not guarantee that funds can’t or won’t break the buck. I strongly encourage investors in money market funds to check with their brokers or financial planners to review the nature of the underlying assets in their money market funds. I would particularly look out for investments in any type of auction-rate securities. In addition to this caution, I would also strongly encourage investors in municipal money market funds NOT to invest in funds which have investments in the newly designed municipal auction-rate security known as x-Tender or Windows. Municipal finance has been largely dependent on newly defined Build America Bonds which entail an obligation by Uncle Sam. Call me suspicious, but I wonder if the exclusion of municipal money market funds is due to the hoped for salvation of municipal finance via the municipal auction-rate security, x-Tender, otherwise known as Porky Pig here at Sense on Cents.